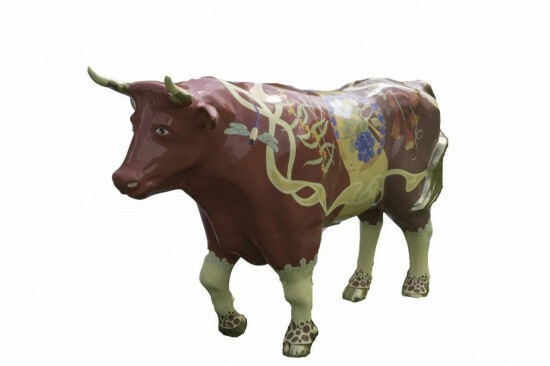 Ox Nouveau will be painted and decorated with gold leaf, with no modification to the body itself. The color scheme will consist of warm fall colors: red, gold ochre, yellow, orange, brown, green and blue violet. The tail, hooves, part of the horns and ears will be covered in antique gold leaf. I have chosen an Art Nouveau style for my ox. I have combined classic Art Nouveau elements of design such as undulating lines and organic forms, with intertwined representations of native Hopewell Valley plants. This allows me to bring together my birthplace, France, and my adoptive home, the Hopewell Valley. One side will include Wreath Goldenrod, Black Cohosh, Rue Anemone, High bush Blueberry and Coral Honeysuckle. The other side will have Meadow Violet—the New Jersey state flower—as well as Winterberry, Eastern Red Columbine, Blue Flag and Woodland Sunflower. I will also include a stylized dragonfly and a honeybee—the New Jersey state insect. The ox’s legs will represent the soil, with stylized rocks and ground cover plants. Materials: water based acrylic latex interior paint, artist's acrylic paint, antique gold metallic foil.